ADAPTIL® can help your dog to adjust better to modern living, by creating a supportive environment to help ease behaviour problems, caused by every day stressful events. This can transform your lives by bringing you closer together. ADAPTIL® is a synthetic copy of the dog appeasing pheromone naturally released by a mother dog to comfort and reassure her new puppies. 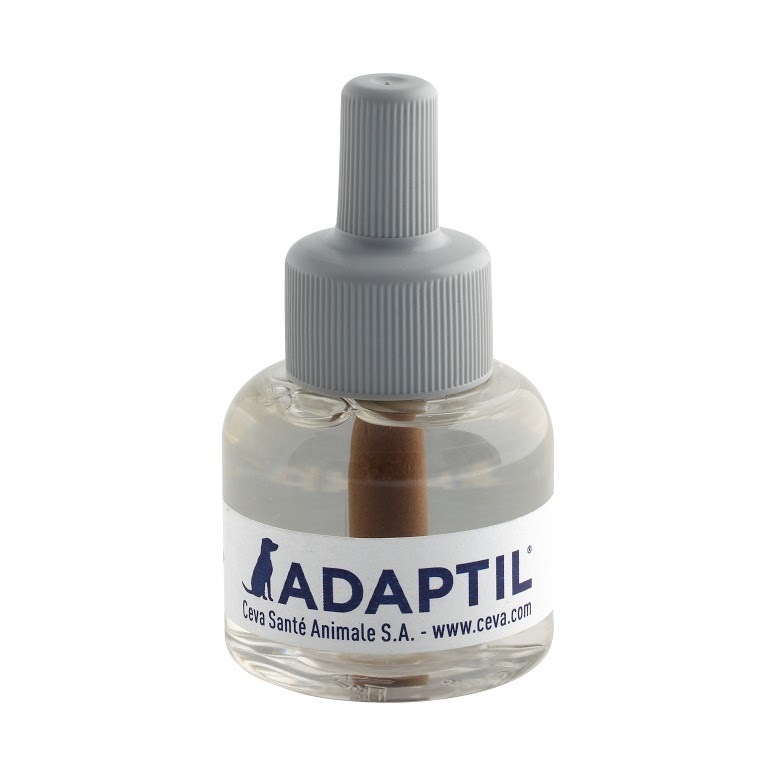 This pheromone has been shown to have the same comforting effect on puppies and adult dogs in stressful situations, when released through ADAPTIL® products. The ADAPTIL® products have been improved to ensure that dogs and owners around the world are provided with the best support. Please note: The diffuser is supplied with just a standard UK 3-pin plug. The diffuser should be replaced every 6 months. Adaptil is also available in Collars and Express Tablets. Not sure which Adaptil product to use? Furthermore, in dogs of any age, stress-related issues which remain untreated, may cause health problems. ADAPTIL® has been scientifically proven to have the same reassuring effect on puppies and adult dogs. It is particularly useful for new or challenging situations. Over 28 published clinical papers support the use of ADAPTIL®. It has been used by vets and pet owners worldwide for 14 years. 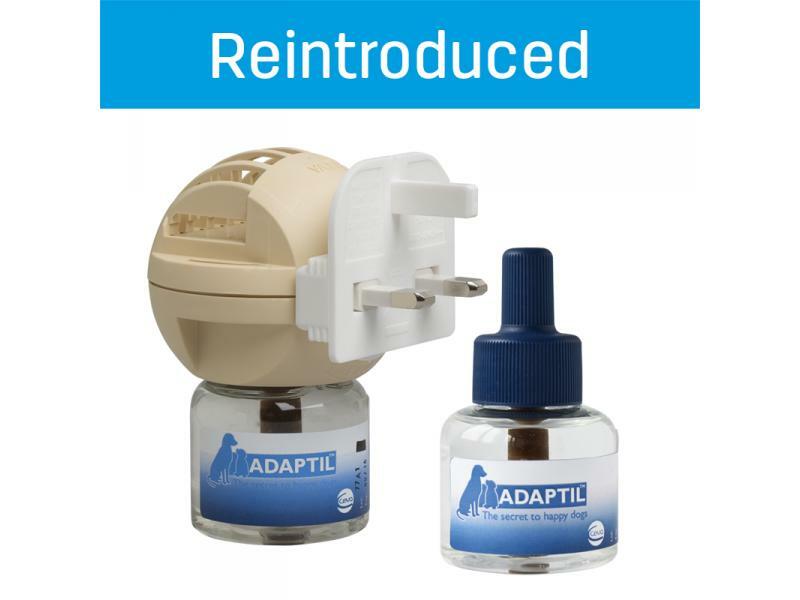 ADAPTIL® is safe, easy to use and convenient. The diffuser releases the comforting pheromone in the local environment and should be plugged into the room where the dog spends most of it’s time, perfect for helping your dog feel confident and supported in their environment. The spray is great for dogs that travel, stay in kennels or are visiting the vet. It can be sprayed onto bedding and carriers. Whether you have just brought a new puppy home or have a much loved adult dog, you may find that from time to time they need help coping with new or challenging situations and the stresses of modern life. ADAPTIL® Spray can be applied directly on bedding, inside crates, indoor kennels , or in the car, but be sure to apply without the dog in the area to be sprayed (particularly inside the carrier or crate) and allow enough time (15 min) for alcohol evaporation. 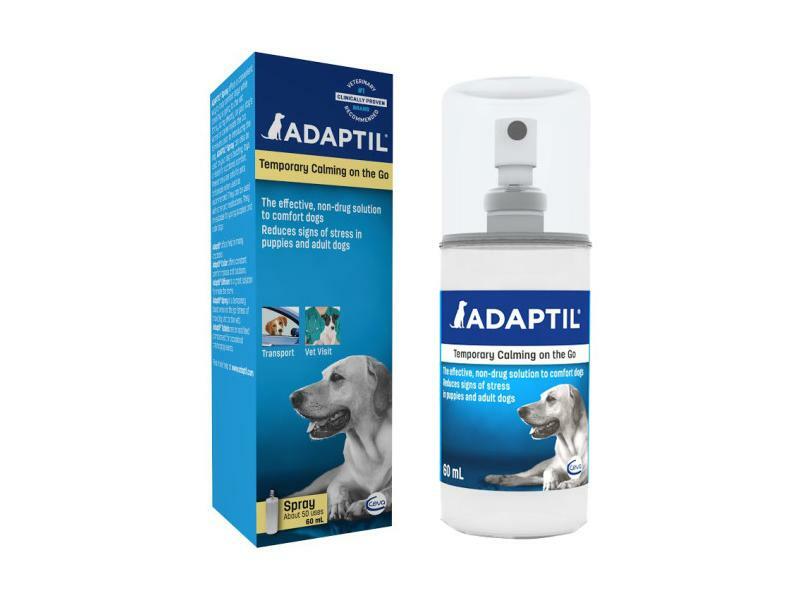 Below are some recent questions we've received regarding Adaptil Spray & Refills for Dogs, including answers from our team. Hi we recently homed a dog from blue cross who put adaptil collars on their dogs before leave is it ok to put the disfusser plug in the house as well or it to much for the dog? Thank you for your question. It is perfectly fine to use the diffuser plug-in together with the collars. Adaptil Spray should only be applied to an environment a dog will be in eg a crate, car, kennel etc, and cannot be sprayed directly onto the dog. If you'd like your dog to have support from Adaptil at all times (inside and outside the house), I'd recommend trying the Adaptil Collars. 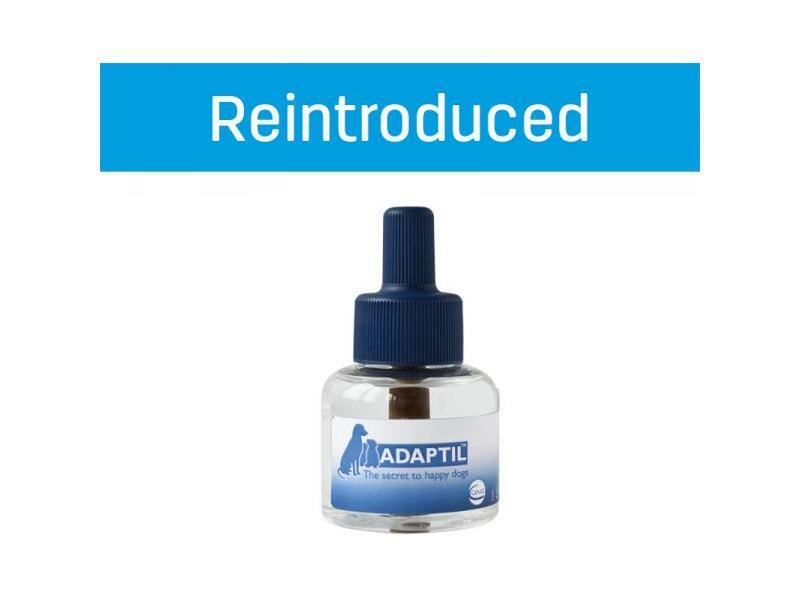 Adaptil Spray is great for short-term support like vet trips and car journeys. The effects last 4-5 hours and the spray must be applied to the area (8-10 pumps) about 15 minutes before the dog is introduced. Waiting 15 minutes lets the alcohol the pheromone is delivered in evaporate. The full usage instructions can be found in the description tab here on our website. There is also a section called 'Not sure which Adaptil product to use?' which will show you which of the products are recommended for your situation eg a new puppy/nervous when travelling/ fear of loud noises/ separation anxiety etc. Hi, I have the plug in which currently has the 48ml bottle in it. Would the larger bottle fit in the same plug in unit or they come in different sizes too? The only size refill vial is the 48ml one. The Adaptil Spray is 60ml but that is just a spray and doesn't go in the diffuser unit. One of my dogs (not the one with the issues) has a heart murmur. Is this product suitable to be used around her? There should be no problems whatsoever as Adaptil is a natural product containing a synthetic copy of the dog appeasing pheromone. It is non-sedative, non-systemic and can be used alongside other types of medication. If you need any further advice, we would advise contacting the manufacturer, Ceva, about it. Dap 48ml lasts how long? The 48ml refills last 4 weeks on average but it can vary slightly depending on air flow in the room, temperature etc. The diffuser itself should be replaced every 6 months. This is completely fine to use with birds. It is true that birds are often particularly sensitive to inhaled toxic substances, but the Adaptil products are perfectly harmless to all species. 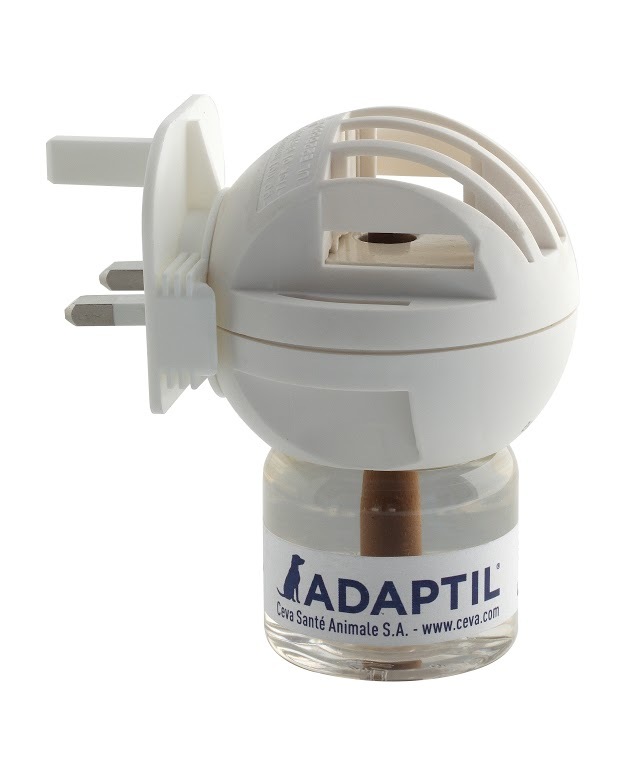 Adaptil is perfectly safe for your wife, and could certainly help with the anxiety. You could try giving the dog Zylkene too if needed. It should be perfectly safe for your wife to handle that too. Separation anxiety can be helped a great deal by the way the dog is managed around the times it is left so you should seek some expert advice about this. Probably there is good information online, or perhaps even contact apbc.org.uk to get some help. Going to Ireland, might be a rough crossing!! she is normally OK on ferry to France although appeared a little 'stressed' once so we went Euro tunnel next. She does travel well but is now 9 years old. Only medication she has every other day is Metacam. Travelling 9th.May .15. thanks. I would give 3 tablets to her 2 hours before you travel. The dose can be repeated 6 hours later. How long do the tablets last? These tablets are a new addition to the range and we have not yet had any feedback into how effective they are. The effect would be expected to last for a few hours. If a longer duration of effect is wanted, then they should be combined with one of the pheromone products. A further tablet dose can be given 6 hours or so later if needed. One diffuser is suitable to cover an open plan room of 50 to 70m². In most instances one diffuser would be enough.